Montville recounts a meeting with Ted Williams. If you enjoyed watching any of Tom Brady’s six Super Bowl championships, you have Leigh Montville to thank for it. 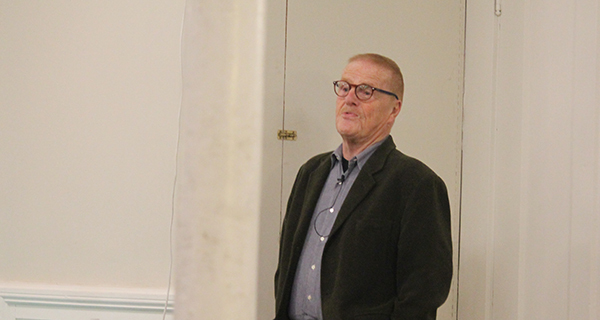 Fresh off the heels of the Patriots’ championship over the LA Rams, longtime Boston Globe and Sports Illustrated sportswriter Leigh Montville spoke to a crowded room of Medfield sports fans in the basement of the First Parish UU. While Montville had many stories about run-ins with famous athletes, it was his Tom Brady stories that most excited the crowd. Montville’s claim that he “helped in getting Tom Brady’s motivation going” was said with tongue firmly planted in cheek - though there is some truth to it. As a kid, Tom Brady discovered this piece, and years later would claim he read it over and over when he needed inspiration to metamorphosize into the star quarterback he eventually became. Another thing that must have inspired Tom Brady was watching the man who wrote his favorite article, ever, fawn over another Michigan quarterback. Sportswriter Leigh Montville fields a question from the crowd. Yes, Leigh Montville first learned of Tom Brady when he was sent to profile the sure-to-be next great NFL quarterback out of The University of Michigan, golden boy Drew Henson. He knew of Tom Brady only as Henson’s backup, and an afterthought to Henson’s future greatness. When asked about why he covered so many athletes about whom books had already been written, Montville retorted: “there’s a new book about Lincoln every year.” He then relayed the story of how difficult it was to pitch a book about sportswriter Will McDonough - publishers demanded a fifty page outline - compared to how easy it was to pitch a book about Ali, about whom publishers asked for only a two paragraph synopsis. While Montville and his fans did lament the loss of must-read sportswriters and the changing landscape of both journalism and book publishing, as long as people are interested in interesting stories, there will always be room for a writer looking to cover iconic sports heroes. Somebody out there is going to be the next Leigh Montville, so why not you? You could’ve been… you would’ve been… who knows? You still might be.